← Where Are Your Manners? This takes approx 20 minutes to make (excluding chilling time) and tastes like a secret recipe your Grandma wouldn’t part with even if you strapped her in a chair, plugged her into an I-Pod and forced her to listen to Kanye West for an hour. The most challenging part of this recipe will be the part where you make it as a gift but because you made it a few days ahead of time and despite your best intentions, you ate most of it yourself. So you had to make another batch. I’ve experimented with assorted types of sugar and pan sizes and concluded that the ideal amount of crunchy toffee should be approx ¼ thick, so the following recipe creates just that. After numerous attempts that in my opinion weren’t 100% perfect and despite their imperfections, the discards were good enough to be eaten by me and voluntary guinea pig-friends. Just one thing; you’ll need a thermometer. That is, one designed for candy-making and deep frying rather than the type you’d plunge into a side of roast beef to check for done-ness and you can’t use the pharmaceutical variety designed for inserting into someone’s orifice. If you feel intimidated at this point, fear not. Wal-Mart makes a completely idiot-proof candy/deep frying thermometer for under $5. And no, you don’t need to be a licensed physician to use it. You’ll also need a large pastry brush. In a heavy medium-sized saucepan, melt the butter gently then stir in the sugar and cream of tartar. Stir constantly over low-medium heat until the sugar softens. It won’t exactly dissolve but will resemble polenta or grits. Gradually increase the heat to medium-high and continue to stir gently. It will bubble a lot. Brush the sides of the pan down with a wet pastry brush. Keep this going, stirring constantly until the candy thermometer you inserted in the mixture reaches 310F / 155C. It can take 15-20 minutes. (If the butter and sugar separate during the cooking process, see the notes below for correcting this). Once it reaches 310F / 155C, pour immediately into the foil-lined pan. Allow it to rest for 1 minute then sprinkle the chocolate chips over the hot toffee. Leave for 2 minutes for the chocolate to soften then with the back of a spoon, spread the melted chocolate until the toffee is completely covered. Scatter the chopped pecans all over and gently press them down a little into the chocolate. Allow to cool enough to put in the fridge then chill completely for at least 4 hours. Using the foil, lift it out of the pan and break into shards about 2-3 inches in size. The best way to do this is not with your fingers but with the point of a very sharp knife. Peel off the foil then slowly stab the toffee vertically downwards and it will break apart like an ice-floe. Keep doing this until you have the sizes you want. Store in an airtight container in the fridge for up to a week or better yet, in the freezer so you won’t be tempted. I confess that I’ve eaten it straight from the freezer. I wasn’t able to locate any 12 x 9 inch pans; they may call themselves 12 x 9 but in fact they’re really 13 x 9 which is too big. However, I did find a disposable foil baking pan made by Hefty that’s 11 ¾ x 9 inches and because you’ll line it with foil you can use it many times. Alternatively, you can use a 9 x 9 inch pan but if you do, you’ll need to cut back the quantity of pecans and chocolate chips to 1 cup of each. This will create a thicker toffee layer and depending on the durability of your dental work it may or may not be acceptable. I prefer a thinner layer of toffee with more chocolate and nuts on top and should you ask – my teeth are fine, thank you. • You didn’t stir it enough. If you don’t keep the mixture moving gently, it can get too hot causing the butter to separate. • If it’s a very warm day and you kitchen feels like a Turkish bath, it’s really not a good time for candy making. Any humidity in the air can cause the butter to separate. • You raised the temperature too quickly. Begin by melting the butter and sugar at a low/medium temperature. Gradually increase the heat to medium-high and always use a heavy pan because it conducts the heat more evenly. I use a cast iron saucepan made by Le Creuset but any good stainless steel heavy duty pan will do. • Another trick: remove it from the heat and stir it gently until it blends back together again. Gradually return it to the medium-high heat, stirring constantly. • You can also rescue toffee that separates by stirring in 1 tablespoon of very hot water. Add additional tablespoons if needed until it becomes a blended mix; as long as you don’t add more than ¼ cup of water overall. OK that’s enough of the sweet stuff for now. I think the next foodie blog will lean more towards some delicious accompaniments to roast turkey……and there will be no Jello-Mayo ‘salad’, green bean ‘casserole’, or anything that involves sweet potatoes sweetened with maple syrup & topped with marshmallows – and then trying to fool you by suggesting its still a vegetable. This entry was posted in Cookies & Edible Gifts, Desserts, Gluten Free Desserts, Made in Under 30 mins. Bookmark the permalink. Your toffee is the best I have ever tasted. What a work, my dear Capricorn! It looks sooo good that I’ll not resist to try it… But what about my hips?? I’ll definitely try this w/ Caitlin when she comes to visit over Xmas. Cannot wait to give this a try. Thanks for the recipe. 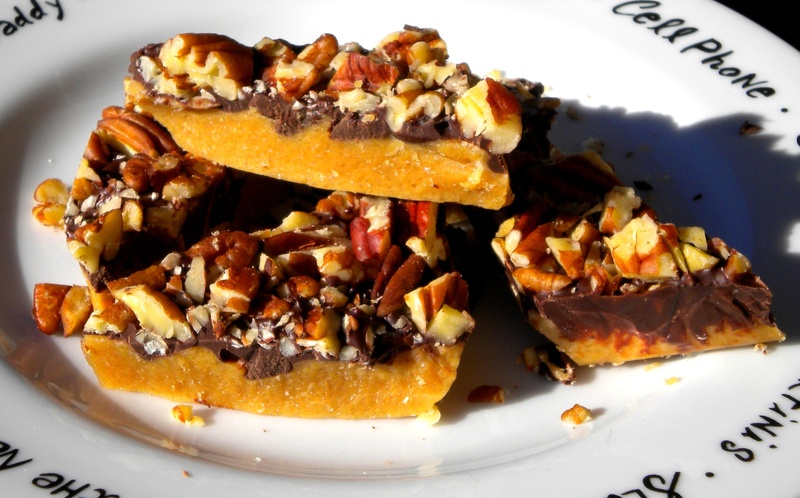 oooohhhh, I can abstain from most anything, ok, that’s a lie…toffee is my absolute favorite. Will try it for sure!